Trump said McCacain did “a horrible horrible thing” by casting the deciding vote against an bill to repeal the Affordable Care Act. 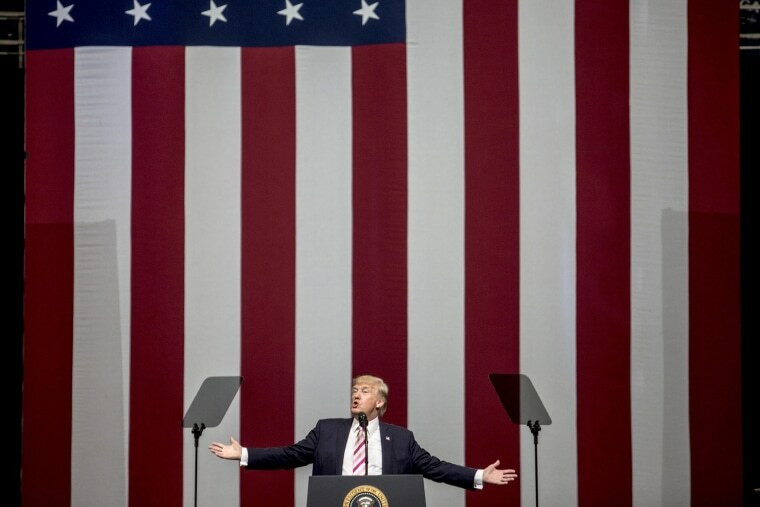 HUNTSVILLE, Ala. — President Donald Trump slammed Sen. John McCain for opposing efforts to repeal the Affordable Care Act, vowing at a Friday campaign rally for an Alabama Senate candidate that Republicans would succeed on health care "eventually." The crowd booed as Trump said the opposition from McCain, R-Ariz., who announced on Friday that he would vote against the latest GOP health care bill, was "terrible, honestly, terrible" when he cast the deciding vote against an earlier measure. "That was a totally unexpected thing," Trump told the crowd. The president went on to say that McCain's opposition was "sad." "It was sad," Trump said. "We had a couple of other senators, but at least we knew where they stood. That was really a horrible thing, honestly. That was a horrible thing that happened to the Republican Party." "It’s a little tougher without McCain’s vote, but we’ve got some time," Trump said, acknowledging the difficulty in passing the Senate health care bill before a critical September 30 deadline. "We are going to do it, eventually." Trump doubled down on his criticism in a series of tweets on Saturday morning. John McCain never had any intention of voting for this Bill, which his Governor loves. He campaigned on Repeal & Replace. Let Arizona down! The boisterous arena rally recalled the heady days of Trump’s insurgent 2016 campaign. Thousands of supporters in the stands reprised chants of "lock her up" about Hillary Clinton and "build the wall," and erupted in cheers when the president called North Korean dictator Kim Jong Un "little Rocket Man." But this time, Trump came as the president, using his first big endorsement trip outside of the Beltway to tout the establishment’s favored candidate in the heated special election to fill the seat vacated by Attorney General Jeff Sessions. Trump’s all-out support for interim Sen. Luther Strange, R-Ala., who is trying to close his gap in polls ahead of Tuesday’s GOP runoff election, is a political gambit, which the president acknowledged. "I’m taking a big risk," Trump said. "Luther Strange is our man." Challenger Roy Moore is an anti-establishment favorite, backed by many of Trump’s most prominent supporters — including Ben Carson, Trump’s HUD Secretary. Trump said critics had given Strange "a bum rap." And he praised the senator’s loyalty in the health care battle, recalling that Strange asked for nothing in return for his support to repeal Obamacare — unlike McCain and other unhelpful GOP senators. "They are not doing a service to the people that they represent," Trump said. Democrats are as rare in Alabama as Louisiana State fans, but Trump warned that Moore, a controversial religious fundamentalist, would have "a very good chance of not winning in the general election" later this year. If Strange pulls off a come-from-behind-win, Trump will get the credit and an infusion of political capital with elected Republicans when he needs it most. "Our research indicates that he is the decisive factor," said Steven Law, the president of the Senate Leadership Fund, a super PAC tied to Senate Majority Leader Mitch McConnell, R-Ky., that has spent almost $8 million backing Strange. Trump is hugely popular in deep-red Alabama, gushing, "It’s nice to go places where people love you." Richard "Gator" Payne, the former commander of the local Purple Heart chapter, acknowledged he didn’t know much about Strange, but said Trump’s endorsement was enough for him. "I’m for Trump, and if Trump’s for Strange, then I’m for Strange," he said. Alex Seitz-Wald is a political reporter for NBC News.